Chicago’s wide range of interesting, world-class museums made it the perfect venue for Ellen Hoobler’s Museum Studies course during Block 4. Based at the McLennan Center, the class visited 17 museums while learning about the work that goes into creating spectacular exhibitions. 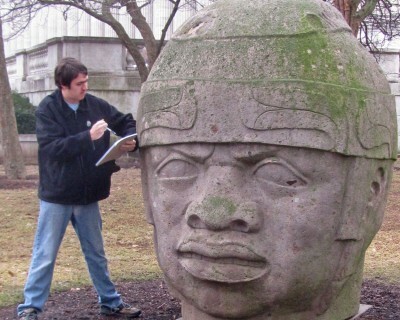 Senior Tom Pitkin examines a replica of an ancient Olmec colossal head sculpture on the lawn of Chicago’s Field Museum. Hoobler’s 14 students explored famous museums, such as the Field Museum, the Art Institute of Chicago, and the Museum of Science and Industry, as well as smaller and lesser known facilities such as Driehaus Museum and Spertus Institute for Jewish Learning and Leadership. Back at the McLennan Center, students read about theories of museums and current issues in the field while reflecting on their first-hand experiences. For their final project, students practiced working as curators by proposing exhibitions based on their interests. They chose topics, selected artifacts and objects to feature, decided how to display those objects, and wrote descriptions for museum visitors. The project was senior Tom Pitkin’s favorite part of the course. “Our group happened to select objects from an [archaeological] site that I have been to, so that was really exciting for me to be able to use knowledge from my archaeology major,” he said. Cornell alumni in the Chicago area also contributed time and insights to the course. David Hanses ’88, director of major gifts at the Museum of Science and Industry, sponsored tickets to his museum and all special exhibitions. The class also had dinner with Cate LiaBraaten ’12, who is currently pursuing a historical administration program at Eastern Illinois University. “I met many interesting people, and I will definitely continue the conversation with them,” said Quinn.